With the launch of our newly added NSE data now is a great time to take advantage and build a trading strategy using Indian stocks. 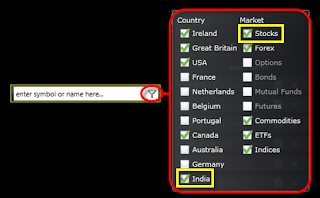 The first step with using any of our Indian data is to ensure you have access to the data. 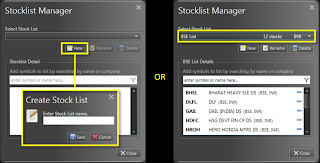 To do this, ensure the [India] and [Stock] boxes are checked in the stock filter options. You can find the stock filter options by clicking the funnel icon inside any of the stock search bars available in our applications or on the Dashboard. Next is to create a stocklist. 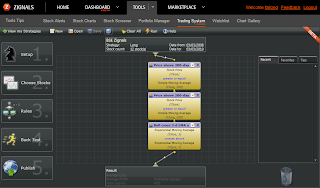 There are two ways to do this: The first is to build a hand-picked stocklist inside the Trading System builder. The second is to use the Stock Screener to build your stocklist. The easiest way is to use the stock screener. So for this filters were set for Return on Equity greater than 17% and a % Change in Revenue; Annual vs Annual of 25% or more, but we have a huge range of options to filter by (and exchanges too). For the purposes of the backtest it is best to use BSE stocks as we have a larger archive of data for testing, but trading strategies can be built using either NSE or BSE stocks. The aforementioned scan reduced the list of stocks to 12. Check all of your results, created a new stocklist ("BSE List"), then added the stocks to the stock list. With a core set of stocks to work with, next is to build a trading strategy around them. 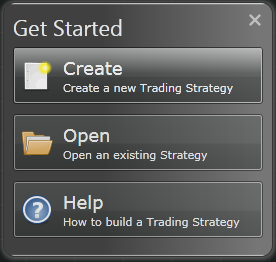 When you open the trading system builder you will be greeted with a splash page which will help you get started - go to Create a New Trading Strategy. The first step defines the risk management, the size of the starting portfolio, the delay between trades, slippage and the amount of capital allocated across positions. Default settings auto-calculate the amount per trade (based on the number of stocks in the stocklist), use a 15-day delay between trades and build in a 0.2% slippage on entry and exits for a 100,000 Rupee account. 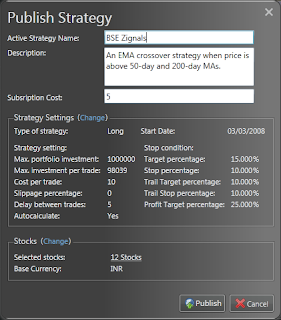 In the strategy detailed here I have increased the starting captial to 1,000,000 Rupee, the maximum investment to 100,000 per trade (it's necessary to first uncheck the autocalculate option to change the value then recheck the autocalculate when done), reduced the delay between trades to 5 days and increased the Trailing stop percentage to 10% and the Profit Target to 50%. You can read more about risk managment settings in this earlier article. Finally, don't forget to give your trading strategy a name! The next step ("Step 2: Choose Stocks") is to bring in the stocklist. 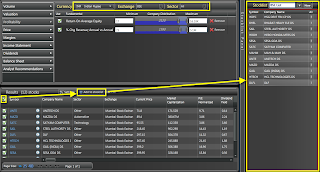 This strategy will use the stocklist created by the Stock Screener, but this is also the opportunity to create a new stocklist or even edit an existing stocklist. The third step is to introduce some rules ("Step 3: Rules"). The easiest set of rules to use are moving averages. Here we will create a rule set which trades two exponential moving average crossovers when price is above both 200-day and 50-day moving averages (i.e. when prices are in a strong uptrend). The final construction phase is to backtest the strategy. Because we have just removed the wrapping off our NSE data we only have a few months of historic data to work with, so it's difficult to run a comprehensive backtest until additional data is collected. However, we have extensive historic data for BSE which allows us to run a comprehensive backtest ("Step 4: Back Test"). If you want to do a quick backtest, simply 'Run' the strategy; this will run the strategy over the past 2 years from today. 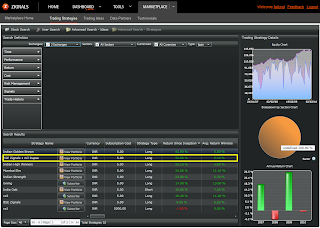 Alternatively, you can select the timeframe for the backtest from the "Step 4: Back Test" menu. 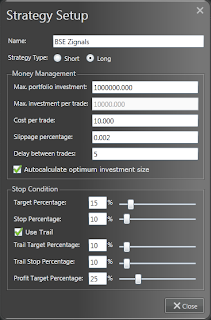 When a strategy is run there is an option to create a Portfolio (created inside the Portfolio Manager application). A Portfolio will give you a detailed analysis of the strategy performance over the past 2 years. It will also show the current holdings of the portfolio. The final step ("Step 5: Publish") activates the trading strategy and starts the process of delivering trading signals to you (via email). It's also the point at which the trading strategy becomes available in the MarketPlace for other users to subscribe to it. 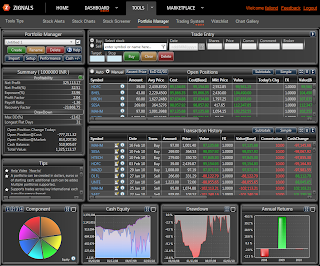 Once we are out of Beta it will be possible to earn real cash selling your published trading strategies in our MarketPlace. When Publishing a strategy, give it a brief description outlining its purpose. The rules for the strategy are kept hidden from the subscriber, but your description can indicate whether it's a strategy based on following a trend or built around a given sector (for example) etc. You can finally view your strategy in the MarketPlace when published. Build as many as strategies as you like in as many markets you want to explore; the choice is yours.